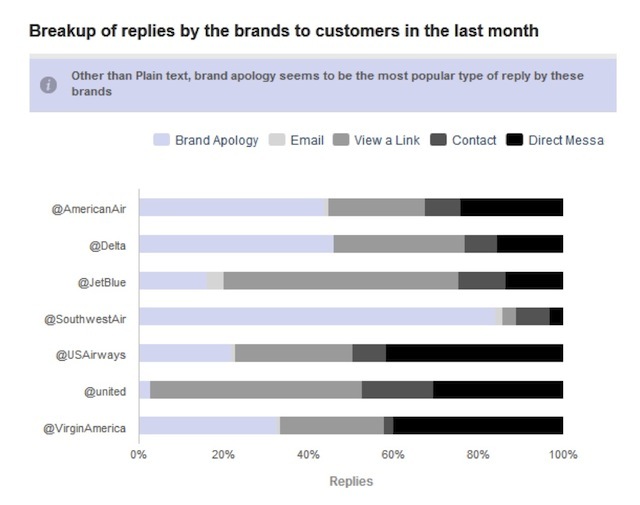 One of the new modules looks at a brand’s replies to customer tweets then breaks them down into five common responses — apologies, prompting customers to send direct messages, prompting customers to call a number, asking customers to email a specific address, or direct customers to a link. Unmetric doesn’t tell you which of these strategies actually results in satisfied customers, but it’s useful to see what the competition is up to — the idea, Unmetric says, is to reveal “industry-wide norms” and best practices. SatisfactionMetrics also includes Unmetric’s Average Reply Time tracker for Facebook and twitter — so a business could see whether its customer service strategy matches the industry’s, and whether it’s responding quickly enough. And there’s also a sentiment analysis module for Facebook. Unmetric said its customers include Subway, Campbell’s, CitiBank, MRY and the Zocalo Group.